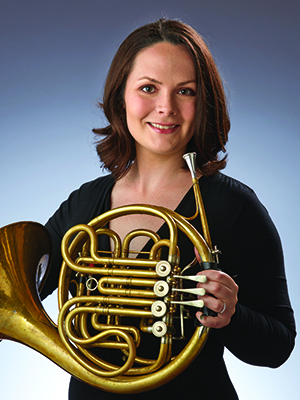 Julie Beckel Yager is a native of Indianapolis and the daughter of Principal Trombone James Beckel. Before attending the University of Cincinnati College-Conservatory of Music under the instruction of Randy Gardner, Julie studied with ISO members Jerry Montgomery and Richard Graef. She was a member of the Honolulu Symphony prior to returning to Indianapolis in 2006. She also performed for three summers with the Verbier Festival Orchestra, touring throughout Europe, Asia and South America. At the festival she performed in a piano quintet with conductor and pianist James Levine. Her horn was made locally by Darin Sorley.